Creating a stunning photograph is all about how you see and capture light. Lighting is one of the main differences between a snap shot and a great shot. I still remember being out on one of my first safaris with professional photographers where they were discussing how quickly the light went flat; I was baffled. I was looking across the savanna and the light looked fine, except that it was about 3 hours after sunrise. I was so new to photography, I really had no idea what was meant by “Golden light”. Being self-taught, it took time to even understand this basic concept, much less the idea of side-lighting, back lighting, and using light to create contrast and shadows for impact. My understanding of light and its impact on an image really began to develop when I started focusing on tribal photography as much as my wildlife. I began following commercial and fashion photographers who were masters of light. Drawn by the dramatic images they were able to create, I went from a wildlife photographer sworn to never bother with flash, to using several speed lights and radio triggers. Subconsciously this began to have a huge impact on the way I photographed wildlife and how I used natural light. I began seeking the light in unique ways for the “Wow Factor”. It took me years to see light in the way I see it today, which is what inspired me to create the spirit-n-light workshop. I wanted to help photographers learn to see the light and use it to create stunning photographs. Below are several sequences of images, all using natural light. Each sequence starts off with a photograph of a subject lit directly with golden light, followed by one or more images where the placement of the light created a more dramatic image. The first image has beautiful golden light creating a wonderful photograph, but the second has the sun placed at about a 45 degree angle, side lighting or rim-lighting my subject. When scrolling through loads of images, the second photograph stands out and grabs the viewers attention. The first image was taken in beautiful evening light with the sun coming from behind me, to beautifully light up the zebras. The second image was taken early in the morning placing the light at about a 45 degree angle from the subjects. The side-lighting allows the sun to filter through the dust particles, reflecting light on to the zebras and illuminating the entire scene. If the sun had been placed behind the zebra’s it would have been a silhouette. The first photograph is another example of an image using beautiful early morning light. In the second image the light is coming from a 45 degree angle from the subject, glistening through the dust and creating a dramatic scene. The beautiful afternoon sun creates a stunning image of this Kara warrior, but the images that follow have greater impact because of how the light is used to create shadows and contrast. The next two images show how using the light changes ordinary to extraordinary. Again, the first photograph is wonderful with the light saturating the horses coats, almost making them glow, but in the second image the light creates contrast, rim-light, shows movement, the horses breath and is clearly more dramatic. Lastly, the first image has beautiful light and movement, but the others that follow are more powerful, leaving the viewer saying, “Wow”. A few weeks ago I found myself in Valley of Fire State Park once again leading a photography workshop. Valley of Fire has become a favorite location of mine for it’s unique and colorful sandstone geology. No other location, as far as I know, has such a rich concentration of dramatic sandstone in one place. The great thing about Valley of Fire is that you can simply park your car and walk out across the sandstone in any direction and find your own unique images. Running a workshop however requires getting clients to some of those “iconic” locations, and it’s my pleasure to do so. All the more so when the weather and light cooperate. Over the workshop the light certainly was dramatic at times! The first image I from the very first field session we had as group. We hiked out to Fire Wave under partly cloudy skies in hopes that we might catch some dramatic light at sunset. Fire Wave has become a popular spot in the last couple of years. So popular in fact that the park decided to put in a maintained trail to the location. In the past, you had to know where to go and simply choose a route across the stone until you arrived at this small yet dramatic parcel of swirling color. We arrived well before sunset and waited and studied the light until it reached it’s most dramatic point about 10 minutes after the sun had set and the sky caught fire with dramatic light. I was immediately drawn to the symmetry between the shape of the clouds and the swirling sandstone in the foreground. The light was pretty intense and required a blend of two exposures to capture the full dynamic range of light –Nikon D800 DSLR, Nikon 14-24mm f/2.8, ISO 50, F11 @ 2 seconds for the sky and 8 seconds for the land. 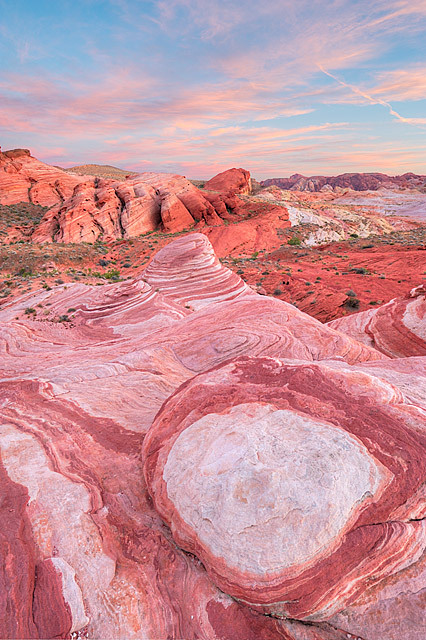 The image above is from a incredibly surreal area of multi-colored sandstone near White Domes. The formation is unofficially known as “Crazy Hill” and it has become a favorite spot to visit for me in the past couple of years. In fact some of my finest images from the park have been captured at this location. I have been trying to capture a traditional take on this formation for some time, but the light and clouds never have cooperated, not until this last trip that is! Nikon D800 DSLR, 14-24mm f/2.8, ISO 100, 1 second @ f11. I captured this image above after the workshop had ended. I had an early flight the next morning out of Vegas and considered driving into Las Vegas in the afternoon, getting a room and sleeping the rest of the day. I was exhausted after ten days of shooting, camping, hiking and finally leading a workshop. Instead I decided to stay the night in Overton and finish up the trip with one last session out in the sandstone. I stumbled on this location about two years ago and immediately fell in love with the swirling s-curve of color. it wash;t until this time around that I got good condition, color and some clouds to capture the image. Nikon D800 DSLR, 14-24mm f/2.8, ISO 50, 4 second @ f11. On the way out of the park, the full moon was rising at twilight. I rushed over to Elephant Rock to try and capture the moon coming up through the opening of the arch. The sky to the east was bathed in a deep blue glow from the Earth shadow and a few clouds on the horizon were still catching some soft pink light. The moon was rising quickly and the stars were beginning to shine. I had time to only shoot three images before the moon was above the arch. Nikon D800 DSLR, Nikon 24-70mm f/2.8, 8 seconds @ F8, ISO 800. I’ll be posting more images from the trip soon. In the meantime, we have some opening for a few upcoming photography workshops if you are interested in chasing the light with me in some of the most beautiful locations in the U.S.
Joseph Rossbach has been photographing the landscape for over fifteen years. 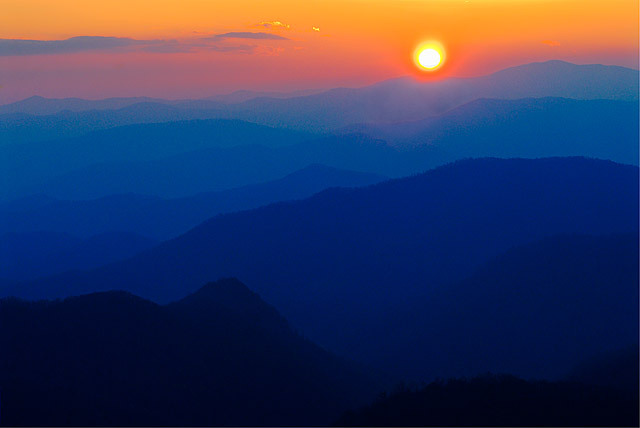 Joe’s photographs and articles have appeared in a number of books, calendars and magazines including Outdoor Photographer, The Nature Conservancy, Digital Photo, Photo Techniques, Popular Photography, Blue Ridge Country, Mountain Connections and many more. Joe is also a staff course instructor for Nature Photographers Magazine, and writes a regular blog column for Outdoor Photographer Magazine online edition. Joe is also a co-author and contributing photographer two print books, The Ultimate Guide to Digital Nature Photography (Mountain Trail Press) and 50 Amazing Things You Must See and Do in the Greater D.C. Area, The Ultimate Adventure Guide. Joe continues to travel extensively producing new and exciting images of the natural world as well as leading several photography workshops and photo tours each year. For February at 6500′, it’s a warm day–about 40 degrees–and the sun makes it feel even warmer as we hike across the windswept grassland plateau. Snow still blankets the north-facing slopes, but the rest of the ground is free of snow, soft, and slightly muddy in places. Everywhere, almost literally, signs of elk abound; I have never seen so many turds and tracks in one place. This small plateau must be great winter ground for them. I haven’t seen (or felt) any invasive Drooping Brome (Cheat Grass) in my socks all day, only native Bouteloua (Grama Grass). Here on the Colorado Plateau, where some areas have been grazed extensively, that must be one sign of a healthy ecosystem. Through the Grama we hike, our heavy packs weighing us down more and more, until–finally–the east rim of the Grand Canyon reveals itself to us. Last weekend, Jackson Frishman invited me to join him on a trip to visit the confluence of the Colorado and Little Colorado Rivers. Jackson’s proposal was ambitious: nearly 40 miles of hiking in 2.5 days, with no water along the route (we had to carry our own water cache). He introduced it to me as a hare-brained plan, and honestly that’s all he needed to say to get me on board. Jackson told me he wanted to visit the confluence because the Grand Canyon Escalade–a proposed tourism development on the western edge of the Navajo Nation, which overlooks the confluence. If the project passes, it would include a tram from the rim down to the Little Colorado River (read more about Escaladehere, here, and here). For me, it was a good time to familiarize myself with this area, learn a little more about the proposal, as well as to visit the Grand Canyon again; I began my backpacking life there, and the Grand Canyon evokes many special memories for me. On Friday night, we discussed the final plans over beers and enchiladas, and it was clear that the stress of planning the trip had turned into excitement for what lied ahead. We started out on Saturday morning; our packs were weighed down with a couple of extra gallons of water for the return hike. We dropped the water underneath a couple of stiff piñon boughs to keep it from freezing, as well as to keep it away from the ravens which were surely watching us. As we got closer to the park service boundary with the Navajo Nation, we found an old hogan, with a missing west wall; the doorway of a Navajo hogan faces east to receive the morning sun and it’s good blessings, and when someone dies in a hogan they are carried out through a hole that has been knocked in the west wall, then the home is abandoned. After several more miles, we crested a hill and scared a large herd of maybe 200 elk out of a drainage. They must have known about a water source that we didn’t. We watched the elk until they disappeared into the horizon and would see them several times over the next couple of days. The final push to the east rim was tortuous; buttes on the north side of the Colorado River were visible, but they never seemed to get any closer. However, finally, after what felt like hours we arrived at Cape Solitude. Solitude indeed. We had not seen any other human footprints all day, and aside from a windbreak built from rocks, our campsite showed no sign of other humans at all. In the second-most-visited national park, solitude can be tough to come by. It’s a special feeling to have a piece of the Grand Canyon all to yourself. We woke up to a windy but beautiful sunrise the next morning and hiked back to our water cache (thankfully untouched) from the day before. After rehydrating, I was happy to hike to our second night’s camp, closer to our trailhead, but with another private view of the canyon’s rim. Horned larks flitting through the sagebrush and elk were our only company. The next morning Jackson and I returned to our cars, shared a couple of cold beers, and parted ways. We hiked through the Grama–through a healthy ecosystem–to a part of the Grand Canyon only a few people get to see. Elk tracks went right up to the rim. I wonder if they admire the view from time to time? In my twentieth year of visiting the Grand Canyon, I still stand in awe of the vast landscape, and can’t help but wonder if some of that awe would be diminished if I could take a tram all the way to the bottom, or if–consequently–the elk tracks didn’t go all the way to the rim. P.S. You can also read Jackson’s post and see his image of Cape Solitude at his blog here. His blog is always worth a visit, with fantastic writing and wonderful imagery. Wendell Berry wrote, “If you don’t know where you are, you don’t know who you are.” This notion of Sense of Place–our geographic location partly defining who we are–resonates with me. Because I was born and have lived my entire life in the American West, the landscapes, people, culture and values of the West have helped shape who I am today. I feel at home in the mountains and canyons I grew up exploring. As a photographer, I continue exploring the wild places I fell in love with as a child. Through my images, I want to foster in the viewer an authentic sense of attachment and belonging to the environment. I make images of landscapes that connect me to these places; often they are intimate scenes whose beauty may not be immediately obvious to the casual observer. As much as I enjoy making images, I’ve been journeying to the kinds of places I go now to take pictures long before I got serious about photography. In fact, one of the things I like about image making is that it allows me to capture a moment and relive the experience whenever I view the corresponding image. An acquaintance of mine once told me that when he saw my images, he often had the feeling that he was seeing a pristine landscape—as though he was the first person ever to see the setting. I’ve rarely, if ever, received more meaningful praise, because one of the most appealing aspects of most of the photo shoots I go on is a sense of quiet—at least, in terms of man made sound. I frequently find myself listening to the sounds of running water, the wind, birds and other wildlife…or nothing at all. Each of the images accompanying this entry reminds me of a peaceful, bucolic experience. On this morning, I was third in line at the gate to get into Cades Cove at sunrise. When the rangers opened the gate, I made a beeline for the back side of the loop road, while others stopped at Sparks and Hyatt Lanes. That gave me the rare opportunity to experience this open meadow with no one else around which made for a very quiet setting…except for some deer moving through the fields and the occasional gobbling of wild turkeys. I spent almost two hours at this overlook on the Blue Ridge Parkway, during which time only three cars passed by. The rest of the time I heard nothing but the sound of the occasional songbird and the rustling of leaves in the light breeze. 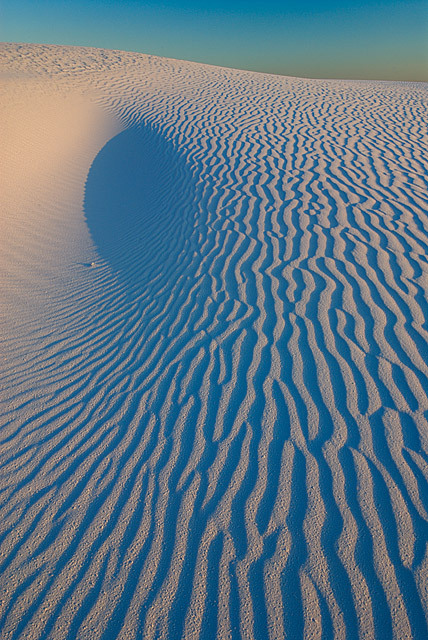 I hiked into the “Heart of the Dunes” at White Sands National Monument about two hours before sunset and returned after the sun had gone down. I never saw or heard another soul. In fact, the only sound I ever heard was my own feet in the sand. When I stood still, the silence was ear-splitting. I didn’t see a single person during the late morning/early afternoon I spent at Cataract Falls State Recreation Area. 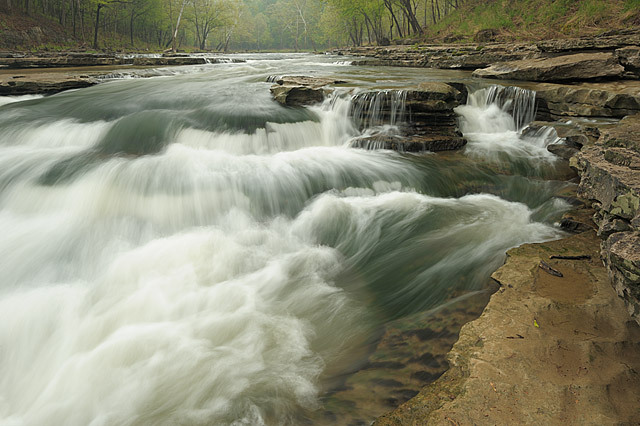 I heard the unfettered sound of the rushing rapids of Mill Creek, and nothing else. 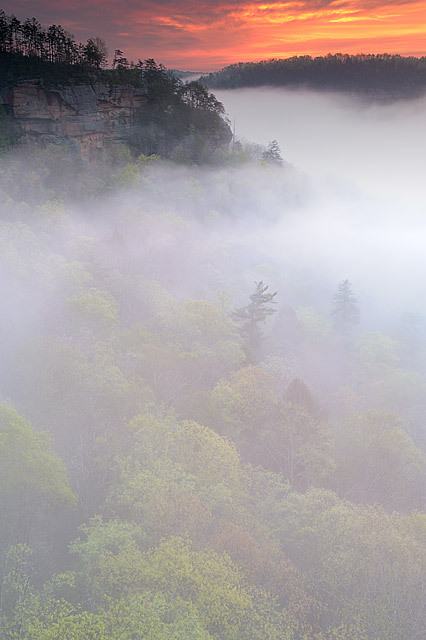 I could hear—but not see—the distant waters of Swift Creek, far below the narrow rock outcropping that I had all to myself on a morning that found the Red River Gorge choked with fog. There had been a few other people at the Fire Wave during the hour-plus that I had been at this location, waiting for the light to improve. Fortunately, by the time it reached its apex, I was all by myself. I could have heard a pin drop a mile away, but there wasn’t anyone there to drop one. I was all alone on a morning so quiet I could hear myself think at Red Jack Lake, miles into the Hiawatha National Forest. It seemed like the epitome of irreverence to make a sound. 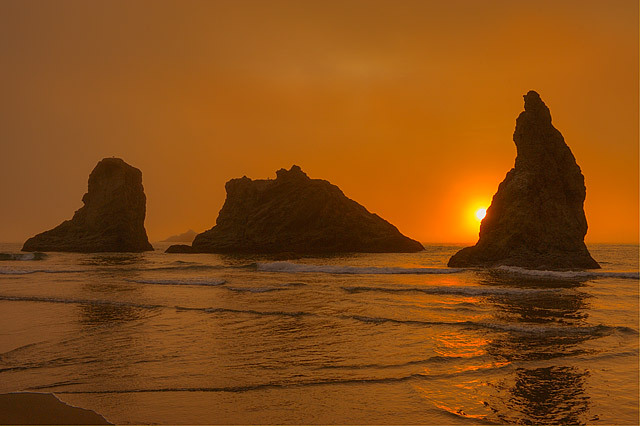 Depending on the time of day, you can wander for miles on Bandon Beach and never see another soul. Not long after making this photograph, I hiked roughly three miles back to Coquille Point, in the gathering gloom, with only the sound of the surf as a companion. Hi, my name is Kerry Leibowitz. I’m a Midwest-based (I split my time between the Chicago and Indianapolis areas) photographer with a particular propensity for the landscape. You can read my other blog posts at my website Lightscapes Nature Photography Blog and see my photo galleries at Lightscapes Nature Photography. The entire contents of my web site, images and text, are the copyrighted property of Kerry Leibowitz and may not be duplicated or reproduced in any form without express consent. Image rights may be purchased; please contact me to make arrangements. Images may not be hot linked. Well it’s official… it’s winter. As I type this post a small layer of snow slowly accumulates on my lawn outside. It’s been three days now and it hasn’t left… I have a pretty good feeling that it’s here to stay. This time of year is always an interesting one for photography. From about November onwards the most prominent colour in the landscape is brown, and most trees are left bare giving the surrounding area a rather dull/dead look. At first glance these attributes are far from attractive and used to leave me with a lack of motivation. As I’ve grown as a photographer I’ve learned how important it is to be able to look beyond first impressions and really study the landscape. There are images everywhere and it all comes down to choosing the right elements such as light quality and composition to help compliment your subject. 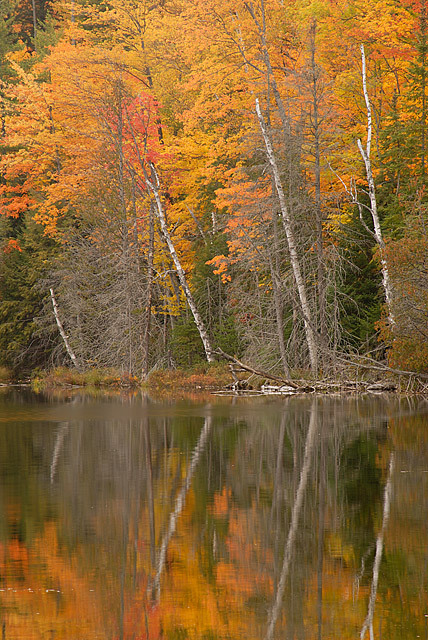 Last weekend I headed out to an area not far from my home named “Torrance Barrens”. This area is a unique conservation reserve designated by the province of Ontario in 1999 as the world’s first permanent dark sky reserve. The area itself is unique compared to anything else in the region. Large rock outcrops and an abundance of plant and wildlife make this a great place to hike and photograph. On top of all this the area is extremely peaceful… every time I’ve visited I’ve either been the only one there or saw few others. This particular morning was fairly mild and the difference in temperature over night left the land covered in thick fog. I roamed the landscape stopping at a few spots to explore the area with my camera and create some more intimate images. This was my first time out shooting since my recent trip to Hawaii and the scenery couldn’t have been anymore opposite. Soft contrast and subtle shapes and colours, compared to big bold dramatic skies and the powerful ocean. To be honest it was a nice change and just reminded me of how much beauty there is in any location. I took advantage of the conditions and explored the area for the first four hours of the morning. This particular morning was proof that some of the best things in life are free. The following is a collection of the images I created that morning. I hope you enjoy!